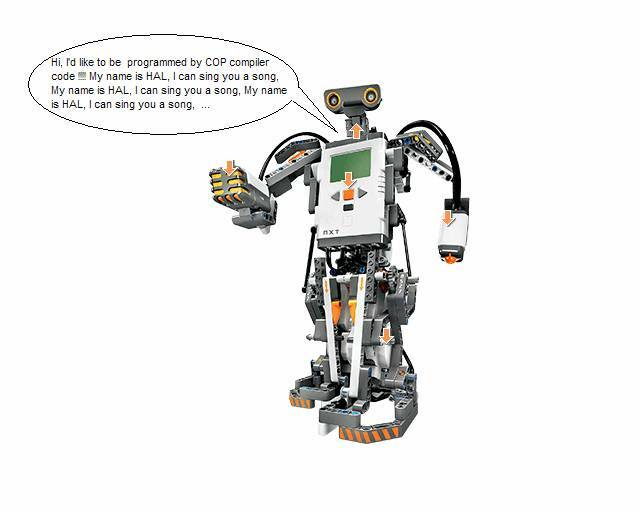 Find in this WEB page, explanations about a C-like COP compiler dedicated to the NXT Lego ROBOT. To be quite honest, I have not built any robots, and my son ( 5 years old ) looks at the mountain of pieces and asks :“Daddy, when are you building this robot ?” and I always answer : “When this compiler is finished !”. I guess he doesn’t understand why. To help other developers, this web page intends to give enough information to make this compiler a reusable source. Find below explanations concerning this compiler and files to be downloaded. 1- What is COP compiler ? For X-mas, I got a Lego NXT robot. As I am a lazy guy, I do not want to code NBC instructions. So I decided to write my own C-like compiler which generates NBC codes. For people which are familiar with the C language syntax, I guess they won’t be destabilized by COP compiler. This compiler is fully open, it means that you can enrich it in term of functions or data or enrich its library as well, C sources are downloadable. As I am not a very good programmer, the C code is not commented ( few comments are in French ) but in section 5, I try to give enough information for a better understanding. Moreover, I have fixed a huge number of bugs, but I am quite sure there are still lot of bugs to be discovered and fixed. Do not hesitate to report bugs. This compiler is compiled with lcc compiler ( http://www.cs.virginia.edu/~lcc-win32/ ) and use an external library (dislin : http://www.mps.mpg.de/dislin/). To complete this introduction, as you can read ( see ) , I am French and English is not my native language, so do not hesitate to report me all misunderstandings due to my poor English. 5) Create you own COP sources in the “source” directory. The use of COP compiler is quite simple. The only thing you have to do is to execute cop.exe. The selection of the “exit” menu will end the program. The selection of the “help” menu will show you the current version of COP compiler. The selection of file will offer you a dedicated window to select the cop file you want to compile. - Syntax Parsing traces : if selected, the entire syntax parsing is traced in the text window. - Syntax tree, types and variables : if selected, the entire syntax tree which is the result of the parsing step is displayed in the text window. - Code generation traces : If selected, traces will be added in the target .nbc file. - Automatic generation mutex : If selected, mutexes are automatically declared and invoked to protect accesses to all functions. To compile the only thing you have to do, is to press the “OK” button. Find below a description of the grammar of the COP language. A COP program contains at least one task which is called ‘main’. This is the entry point of the program. Several tasks can be defined and launched, see precedes. These tasks can be executed in parallel. A COP program can contain several functions. Some of these functions are defined in libraries, eg. COP_wait() and cannot be double defined. As they are not really local variables ( they are emulated by the COP compiler ), mutex can be automatically generated at complie time to have a one and only one call at a given time. Cop program can define data types and structures. Nota : float is not available, this type is not supported by the NXT. I am writing a library dedicated to “float” an mathematic functions ( cos, sin, … ). Nota : bollean type doesn’t exist, but can be replaced by a byte variable, 0 is ‘FALSE’, all other values (>0) are ‘TRUE’. Pointers are used to handle arrays which are passed as ‘reference’ parameters in function. Arrays are scalar types. Arrays can be applied to atom or structures. Arrays can be multi-dimensional, COP compiler support up to 10 dimensions. These dimensions are used to address the exact memory location. Strings are defined as arrays of char, eg. char String. Strings must be terminated by a null byte. Nota : If arrays are passed by ‘reference’ in a called, they must be then used as pointer in the called function. A structure is set of fields which are gathered into a one and only one structure. A structure can contains, atoms, arrays, structures or arrays of structures. The ‘break’ instruction ‘jumps’ to next instruction which follows the for loop. The ‘continue’ instruction ‘jumps’ to the beginning of the for loop but executes the incremental instructions. The ‘break’ instruction ‘jumps’ to next instruction which follows the for do/while loop. The ‘continue’ instruction ‘jumps’ to the beginning of the do/while loop but executes the incremental instructions. return is use to return value ( amazing ! ). Return can only be used in functions which return values. return can contain complex expression, but the return type must comply with the declared type of the function. label and goto are used to jump to a given instruction of the program. God of programmers never uses the goto instruction, using goto is strictly forbidden ( even in the toilet J). Obviously , to program a goto, a label must be declared in the code. inline is a very simple and powerful instruction. It can be used to directly low level nbc instructions. ‘inline’ is also massively used in libraries to make the link between COP functions and nbc libraries. Nota : the text between the two quotes is not parsed. - cop.c : this is the heart of COP compiler, this module contains the entry point of the program ( main ) and the calls of the four passes. - delta_encrier.h : this header contains C structures and defines used by COP compiler. Above, a schema which illustrates flows and main functions of the COP compilers. The first pass, pre-processing, parses all files and stores all defines ( #define <ident> text ). The second pass, lexical parsing, parses all files and identifies a flow of lexem ( +, -, <ident>, for, if, else … ), if an <ident> is detected and if this <ident> is a ‘define’, it is replaced by its value. The third pass, syntax parsing, parses the list of lexems according to the grammar rules specified in the chapter 4- Grammar implemented in COP compiler. ð it generates table of structures, table of variables, table of functions, table of tasks, tables of instructions. Those table can be considered as a syntax tree. The fourth pass, code generation, generates the NBC codes by analysing the syntax tree. In the next chapters, main data, and each pass is explained in detailed. Below the data model of the COP compiler. This variable contains the Variable_globales array. The principle is that even if we are facing to a local variable of a function or a task, variables are stored in the same table. To find the relevant variable, first, we always try to find it in the function or task and if it is not defined at this level, we assume that it is a global variable. This table contains the list of task that are defined in the program. This structure models variable, both global and local variables. This is a recursive structure. This structure models binary expression, in other words a node of a binary tree which contains an operator and 2 or 1 argument. Example, < +, sub-exp1,sup-exp2> or <not,sub-exp1,null > or a leaf (feuille in French ). This structure models indirection of a pointer. This structure models variables which can be simple variable such as i or j, or scalar variable such as array ( t[i] ) or structures ( a.b.c ). This structure models an assignment of a variable. This structure models the « if » instruction. This structure models the « for » instruction. This structure models the « switch » instruction. This structure models the « do while » instruction. This structure models the « return » instruction. This structure models the « arrsize » instruction. This structure models the « arrinit » instruction. This structure models the « arrsubset » instruction. This structure models the « arrbuild » instruction. This structure models the « precede » instruction. This structure models mutex ( semaphore ). The entry point is the lexical.c :: analyse_lexicales_define() function.This function calls the lecture_donnees_define() function. The lecture_donnees_define() function opens the file to be parsed, calls a line after line parsing function named analyse_fichier_ligne_a_ligne_define(), and then closes the file. The analyse_fichier_ligne_a_ligne_define(), parses line after line the file and store defines in the tab_define array ( nb_define is the index ) by invoking the ajout_define() function ( ajout = add in English ). The lexical parsing is far more complex. Before commenting in detail the C code, below a summary of the lexical parsing principle. The lexical parsing analyses a flow of ASCII characters and generates a flow of lexems. All ASCII characters between /* ignored ASCII charecters and */ are ignored. /* */ is used for comments. All ASCII such as CarriageReturn, Line Feed, Tab … are ignored. In theory, lexems to be recognized can me modelled as a state machine. The principle is to recognize the longer string as possible. In this state machine, there are states and arrows between states. “Start” is the initial state. LBEGIN, LEND, LENTIER … are “end” states. The current ASCII character is the key used to determine the relevant transition between two states. Actually, in COP compiler, this state machine is hard-coded. The entry point is the lexical.c :: analyse_lexicales() function.This function calls the lecture_donnees() function. The lecture_donnees() function opens the file to be parsed, calls a line after line parsing function named analyse_fichier_ligne_a_ligne(), and then closes the file. The analyse_fichier_ligne_a_ligne(), parses line after line the file, skips comments ( /* */ ) and recognized lexems ans stores them in the Techant array ( nb_echant is the index ). Before commenting in detail the C code, below a summary of the parsing principles. The syntax parsing analyses a flow of lexems character and generates a syntax tree. In theory, there are different types of languages, some of them can be modelled by using state machine, eg. LALR(2) state machine. Smart programmers use yacc tool ( yet another compiler compiler ) to generate automatically state machines. As I am not a smart guy, I have chosen to program my own syntax parser by using a simple “functional” parser. In a nutshell, a functional parser associates a function per “grammar rules”. The stack which saves contexts is handled by the compiler itself and is managed by the micro-processor during the execution. The top-down approach is based on the fact that the grammar rule to be recognized is chosen first, in other words, before having read all the tokens. That’s why in some cases, backtrack is required if ambiguous choice between several grammar rules occur. The bottom-up approach is based on the fact that the grammar rule to be recognized is reduced after a complete recognition of the right part of the “grammar rule”, e.g <A> -> <atome> () is reduced only if <atom> and () have been previously recognized. In some cases, there are conflicts between rules to be reduced or reduce/shift (reading ). To solve conflicts, there is a simple method which consists in determining the next token to be read in order to choose the relevant action to be processed. For example to choose between “shitfing” <inst> in the rule <sint> -> .<inst> <sint> or reducing <sint> -> <inst>., you may say that if the following token is “}” you reduce else you shift. But in some cases this method do not solve the problem, more powerful state machines must then be used. 1. The stack is initialized with . The current state will always be the state that is at the top of the stack. 3. Step 2 is repeated until either the string is accepted or a syntax error is reported. Below an execution of the algorithm according to the table of action.